First Episode Get the Show on the Road! Last Episode Watt’s with Wattson? Polishing off the Silver Conference, Ash heads toward his next challenge—the far-off Hoenn region! While he must say goodbye to old friends, he makes the acquaintance of May, a Trainer just starting out on her Pokémon journey. Along with her little brother Max and the ever-reliable Brock, this pack of Pokémon Trainers begin pursuing their dreams—with Ash racking up three Gym Badges, while May changes tack to follow the Contest path of a Pokémon Coördinator. J# 277 "Get the Show on the Road!" May is off to get her first pokémon as an excuse to travel. Ash arrives in Hoenn with an ailing Pikachu. He calls Professor Birch who comes right away and rushes Pikachu to his lab. Meanwhile May arrives for her pokémon journey. With having selected Torchic as her first pokémon, and Pikachu well, and her bike destroyed, May asks to travel with Ash. Ash accepts and they both begin their exploration of Hoenn together. J# 278 "A Ruin with a View"
While Ash begins May’s training, the Team Rocket Trio are given orders by Giovanni to start a Team Rocket branch in Hoenn. His idea is to keep the Trio busy, while they brief him on the operations of Team Aqua and Team Magma. Ash and May are there when Professor Alden discovers the passage to ancient pokémon for him to study. They also meet Team Magma for the first time. Next stop is Petalburg City for Ash to face his first gym battle against a gym leader who May says she doesn’t know. J# 279 "There's No Place Like Hoenn"
Ash arrives at the Petalburg City Gym only to find out that he needs three pokémon in order to challenge the gym leader, Norman. He meets Max who is Norman’s son and May’s little brother. Norman battles Ash unofficially with a vigoroth. Max is given permission to travel with Ash and May, and is given a PokéNav in order to help find their way around Hoenn. J# 280 "You Never Can Taillow"
Ash has new companions to get used to. They run afoul of a flock of taillow led by one especially feisty one. They are soon joined by Brock who decided to catch up with Ash after finishing his family errands. Ash catches Taillow as his first caught pokémon in Hoenn. They all continue onward to Rustboro City. J# 281 "In the Knicker of Time!" Ash and company meet an eccentric pokémon trainer who gives May her first pokémon battle. J# 282 "A Poached Ego!" Ash and company help the local Officer Jenny capture a poacher, but not until the Team Rocket Trio have Arbok and Weezing lead the ekans and koffings that he caught to safety. Meanwhile James gets Cacnea. J# 283 "Tree's a Crowd"
Ash tries to catch a treecko who is defending a giant tree which it was born in. Ash helps to save the tree, but it dies making way for its seed to sprout into a new tree that will grow to replace it. Ash battles the treecko to capture it. Now Treecko is the second of Ash’s new pokémon. J# 284 "A Tail with a Twist"
Ash and company are attacked by a hungry seviper. Treecko attacks but is hurt. They chase it off, but Jessie catches it. Treecko goes into its own training session then when the Team Rocket Trio attacks with Seviper, Treecko beats it, leaving Pikachu to do the rest. J# 285 "Taming of the Shroomish"
After arriving in Rinshin Town, Brock and May check out a “haunted” mansion, while Ash and Max make friends with a shroomish. 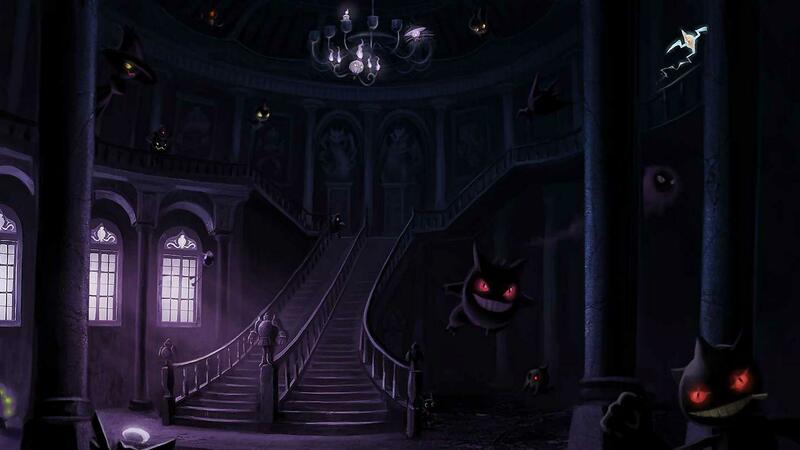 The shroomish runs inside the mansion causing Ash and Max to meet up with Brock and May. They meet Alex, the owner of the mansion who has agreed to allow the city to demolish the mansion and cut down the remaining forest to build more urban area. They come to the conclusion that the strange happenings inside the mansion are the shroomish defending what is left of their home. After an attack by the Team Rocket Trio, Alex decides to restore the forest after the mansion is demolished to create a shroomish habitat within the city. J# 286 "You Said a Mouthful!" Out in the suburbs, Ash and company notice a sign advertising a gym with the world’s most powerful pokémon. Of course Ash has to battle it, if for no other reason than to find out what pokémon it is. It turns out to be a pellipper, a pokémon that is able to store many items inside its bill. Ash challenges it, but it is an unusual pellipper as it knows not only water and flying attacks, but grass, fire and electric attacks as well. How is this even possible? J# 287 "A Bite to Remember"
Ash and company enter a pokémon preserve guarded by Ranger Katrina. She has three mightyena and a poochyena that were all born at the same time, but the poochyena has yet to evolve. Max wants to see a pokémon evolve and thinks that the poochyena should evolve. Brock and Ash teach both Max and May about all the different ways pokémon evolve. They also teach Max about reasons why some pokémon don’t evolve even if they are able to. J# 288 "The Lotad Lowdown"
Ash and company wind up helping out at a flower shop and berry farm run by three sisters. Older sisters Rita and Nichole and their ten year old sister, Natalie. They are having problems with their watering system that is old and needs to be replaced. The local lotads, who all have a special move, Water Gun, help out watering the plants. One in particular, seems to have a concentration problem. Brock coaches it and it improves. The Team Rocket Trio appear to steal the lotads, but the one special lotad helps Pikachu end their scheme. When it comes time to leave, the lotad makes it known that it wants to leave with Brock. Brock adopts Lotad who becomes part of the group. J# 289 "All Things Bright and Beautifly!" Ash and May are introduced to pokémon contests, and May is considering becoming a coördinator instead of a trainer. Ash learns the Rustboro City Gym is a rock gym, then is advised to teach Pikachu to use Iron Tail. J# 290 "All in a Day's Wurmple"
May goes after a wurmple and catches her first pokémon. Torchic is getting stronger. Pikachu almost has learned to be consistent with Iron Tail. J# 291 "Gonna Rule the School!" J# 292 "The Winner by a Nosepass"
May finally admits to everyone that she wants to be a pokémon coördinator. Ash battles Roxanne for the Stone Badge and wins. All this fuss over teaching Pikachu Iron Tail, knowing that Treecko trained at that waterfall learning to break rocks with his tail using Pound. J# 293 "Stairway to Devon"
Mr Stone, the company president, gives Max a guided tour of the Devon Corporation. Then has his assistant gives the rest of the gang a tour. They prevent a theft from the company by a Team Aqua spy. Okay, the Team Rocket Trio helped too. Sort of. Officer Jenny then tells them about the rival organizations, Team Aqua and Team Magma. Dewford Island is their next destination where they are told Stephen, the son of Mr Stone, is currently located. J# 294 "On a Wingull and a Prayer!" Due to an old map May is using, Ash and company wind up having to miss the ferry to Dewford Island. Wanting to make up for the trouble she caused, May finds an old sailor willing to help. But the Team Aqua spy that escaped the day before finds Mr Briney before May can return with the others. When they arrive Mr Briney sends them away to protect them from being harmed. They figure out what is going on and help Mr Briney get his pet wingull back. With Mr Briney’s ship they will finally be on their way to Dewford Island. Stopping off at an uncharted deserted island that only Mr Briney knows about, Ash and company are attacked by a school of sharpedo, an example of poor life decisions. Fortunately, Ash and company don’t hold grudges. J# 296 "Brave the Wave"
Ash meets Brawly, the Dewford gym leader who enjoys surfing. Ash insists on a gym battle and considers Brawly a gym leader who doesn’t take battling seriously. Ash loses and learns that playing is also a form of training. J# 297 "Which Wurmple's Which?" While the Team Rocket Trio try another scheme to steal all the Pokémon of Ash and company, May and Jesse get into an argument over which of their wurmple is better. The wurmples accidentally get switched, but May notices right away the wurmple she has isn’t hers. Jessie, not so much. J# 298 "A Hole Lotta Trouble"
Looking for Stephen, Ash and company enter Granite Cave. The Team Rocket Trio somehow knew this and dug another pitfall trap before they arrived. Ash and company fall for it, but the Trio also get trapped. Meanwhile Stephen becomes aware that something just happened and starts searching to find out what. Everyone else is split up into three groups wandering around the caves trying to find a way out. After they properly meet him, Stephen drops off Ash and company at a spot on Dewford Island that he recommends as a place for training. Ash and company set up camp only to be under constant attack from a mysterious pokémon. The pokémon turns out to be a corphish which Ash becomes determined to catch. Observation: While Max points out a trainer is only allowed one pokémon per contest, May could train both at the same time, and switch between them each contest. J# 300 "A Corphish Out of Water"
During a Team Rocket Trio attack, both Jessie’s and May’s wurmples evolve. May’s wurmple becomes a silcoon, while Jessie’s becomes a cascoon. However, having incomplete knowledge about pokémon, Jessie assumes hers is a silcoon as well. James and Meowth notice the difference, but also know Jessie’s temper. Corphish becomes ill from the rope and floaters it ate earlier. Ash rushes it to a PokéCenter while the Team Rocket Trio use new traps to catch the “twerps” and their pokémon. Of course, they get caught in their own trap too and now everyone is in danger of drowning when the tide comes in. Trivia: Ash only scanned May’s silcoon, because that was the only one he cared about. Granted, strategically, he should have wanted to know more about Jessie’s cascoon as well. Max to May: Maybe you should be following Ash’s example, it couldn’t hurt. May’s Reply: You’re right, but I can think of something that will. J# 301 "A Mudkip Mission"
Ash and company find out where starter pokémon come from when they stumble upon a secret mudkip breeding farm. Brock makes friends with a wild mudkip and adopts it. Observation: All that the Team Rocket Trio had to do (and still could) is report to Giovanni the location of the mudkip breeding farm. J# 302 "Turning Over a Nuzleaf"
When Corphish abruptly awakens a loudred in a cave, most of the pokémon of Ash and company get separated from their trainers during the commotion. Pikachu and company run into conflict with a tribe of nuzleaf and the Team Rocket Trio try to take advantage of the situation. J# 303 "A Three Team Scheme!" Ash and company are joined by Professor Birch. They help Keanu, a trainer, recover his secret base and his nincada that was stolen by the Team Rocket Trio, who then lost the base and pokémon to Team Magma. Team Magma tunnels to a primitive ruin in hopes of finding an artifact and the Cave of Origin. Team Aqua shows up as well. Professor Birch along with Ash and company overhear the conversation between the commanding officers of both teams. The teams are looking for an indigo orb and a rose orb to be found in the real Cave of Origin. Both teams leave after they fail to find what they are looking for. Team Rocket leave by Keanu’s nincada hitting them with Hidden Power. J# 304 "Seeing is Believing!" The rivalry between May and Silcoon and Jessie and her cas—er, silcoon intensifies. Especially after Silcoon evolves into Beautifly and Jessie’s pokémon doesn’t. Even Professor Birch is unable to convince Jessie that her silcoon is actually a cascoon. The moment James and Meowth have been dreading arrives when the cascoon evolves into Dustox. Jessie takes it in stride loving the obviously superior Dustox over the inferior Silcoon. Professor Birch with the assistance of Ash and his friends help relocate some seedot who are in need of a new home. J# 305 "Ready, Willing, and Sableye"
The Team Rocket Trio come across an abandoned gold mine and start to explore it when they are frightened by something in the shadows. Jessie and James escape, but Meowth is left behind. The ghostly being turns out to be a sableye who enjoys frightening humans. Ash and company are tired of Corphish’s tendency to ignore commands. When they come across the same gold mine, Ash comes up with an idea to try and “train” Corphish to be more coöperative. Meowth pretends to help sableye play a prank on Ash and company, just to capture their pokémon for Team Rocket. Observation: Neither Ash, Brock, or May had the presence in mind to battle and catch sableye to join any of their teams and travel with them. J# 306 "A Meditite Fight!" One morning a girl arrives at the camp of Ash and company on a surfboard. She is Shauna, who claims to be Brawly’s assistant and girlfriend and challenges Ash to a battle. Their battle is interrupted when Brawly arrives to warn them of a hurricane approaching. They take refuge in a cave and wait out the storm while discussing Nature and battling techniques. Ash and Shauna have a rematch and Brawly accepts Ash’s request for a rematch. J# 307 "Just One of the Geysers"
Brawly takes Ash and company to his secret practice field, just off the coast from where the camp is, for the rematch with Ash. Ash wins the Knuckle Badge. Because of a failed attempt by the Team Rocket Trio to catch Pikachu, Ash and company are left adrift on a ship. The ship drifts to an abandoned luxury liner that they hope will have a working radio. They discover that Tommy, a young man who had been a passenger on the “Forsaken Ship” when it crashed into the rocks had returned to see if the ship was salvageable and to see if he could find his marshtomp who he lost there. One by one the party members disappear. J# 309 "Now That's Flower Power!" J# 310 "Having a Wailord of a Time"
J# 311 "Win, Lose or Drew!" J# 312 "The Spheal of Approval"
J# 313 "Jump for Joy!" J# 314 "A Different Kind of Misty!" J# 315 "A Poké-BLOCK Party!" J# 316 "Watt's with Wattson?" Ash arrives in Hoenn with an ailing Pikachu. Professor Birch rushes Pikachu and Ash to his lab to restore Pikachu to health. Soon after, May arrives to pick her starter pokémon so she can have an excuse to travel the world. Unfortunately, while Pikachu was delirious, he destroyed May’s bike. May brings up this and asks Ash if she can travel with him. Ash now has a fear of girls with bikes destroyed by Pikachu, and quickly agrees. He also winds up training a rookie trainer. Soon they are joined by May’s little brother, Max, who is given a PokéNav by Norman and becomes their official navigator. Max is thrilled as the only pokémon knowledge he has is what he has read in books, and Oak’s pokémon lectures watched on television. Brock, having completed his family “errands” (see Pokémon Chronicles, “A Family That Battles Together Stays Together!”), catches up with Ash, May, and Max just as they were discovering how desperately they needed organization and especially food. Now with a well-rounded team, the four of them set off to explore Hoenn together. E#277 May chooses Torchic as her first pokémon. E#277 May begins her first pokémon journey and Ash begins his Hoenn journey. E#279 Max joins May and Ash. E#280 Brock catches up with Ash and joins the group. He only has Forretress with him. E#292 May finally announces her decision to become a pokémon coördinator. E#301 Ash and company find out where starter pokémon come from. E#303 Ash and company with Professor Birch learn more about what Team Aqua and Team Magma are looking for, but don’t tell anyone. E#303 The one thing Giovanni would like to know about and Team Rocket doesn’t realize they should report the activities of the two rival Teams. E#306 Shauna becomes Brawley’s gym assistant and battles Ash. E#312 Team Magma steals a rock sample from the Slateport Museum. E#315 Marker Jigglypuff makes its final guest appearance until the Sun and Moon series. Watson is stunned by three one-hit knock-outs in a row. All about the Pokémon we see in the first season, whether we see them caught, they were already owned prior to the events of Season 1 or we witnessed them via evolution they're all here broken down into different tables. There's also a table for the Pokémon we said goodbye to this season. A list of Pokémon we see Ash, Misty, Brock and other characters capture on their Pokémon journey. Torchic May 277 Granted to her by Professor Birch as a starter pokémon. Cacnea James 282 Cacnea follows James after James gives it a cookie. Treecko Ash 283 Straight capture. Seviper Jessie 284 Straight capture. Lotad Brock 288 Brock adopts Lotad. Wurmple May 290 Straight capture. Corphish Ash 299 Straight capture. Mudkip Brock 301 Swampy asks Brock to take Mudkip with him so it won’t be lonely. sableye 305 Completely missed opportunity by everyone to get a cool dark pokémon. These pokémon were already owned / associated with people prior to the events we see onscreen. This iist does not include pokémon listed in previous seasons. E#282 Jessie and James sends away Arbok and Weezing to lead the wild ekanses and koffings to safety. E#287 A poochyena becomes a mightyena for Max. E#296 Brawly’s makuhita becomes a haryama. E#300 May’s wurmple becomes a silcoon. E#304 May’s silcoon becomes a beautifly. E#304 Jessie’s silcoon* becomes... an obviously superior dustox. E#310 A starter torchic evolves into a combusken. * Jessie insists it’s a silcoon, but even Professor Birch is unable to convince her that it’s a cascoon.